On Saturday, July 9, Roger Castillo, a San Jose truck mechanic, was walking his dog along a levee next to the Guadalupe River, just north of West Trimble Road and the Mineta San Jose Airport. Castillo has been monitoring the Guadalupe watershed for many years as a volunteer for the Guadalupe-Coyote Resource Conservation District. While investigating an eroded drainage ditch, Castillo discovered what were clearly some large bones poking through the sandy clay. Recognizing their possible importance, Castillo began making phone calls, to both the Santa Clara Valley Water District (SCVWD) and local universities. Once word of the find hit local newspapers, volunteers and security guards hired by the water district rushed to guard the site from vandalism and any unauthorized collecting. UCMP assistant director Mark Goodwin visited the site on Wednesday, July 13, and tentatively identified the bones as those of a Columbian mammoth, an elephant relative that lived in the Bay Area during the Pleistocene. could be discovered once excavation began, either deeper in the sand or washed farther downstream. The SCVWD generously provided funding for the excavation of the bones. 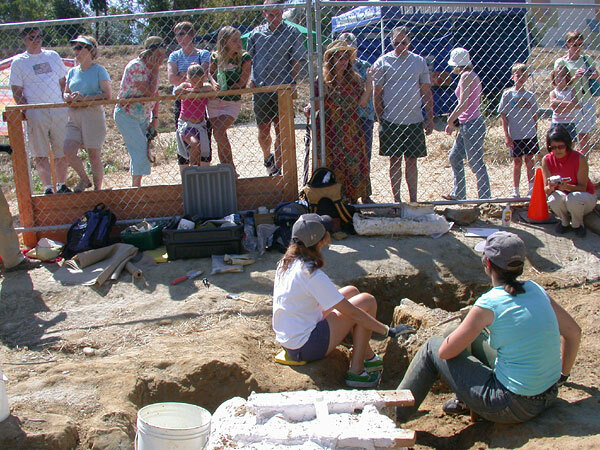 Prior to the beginning of excavation, sandbags were placed around the area containing the exposed bones in an attempt to keep the bones dry. This was not entirely successful, but the water district solved the problem by pumping water out of the channel upstream from the site.